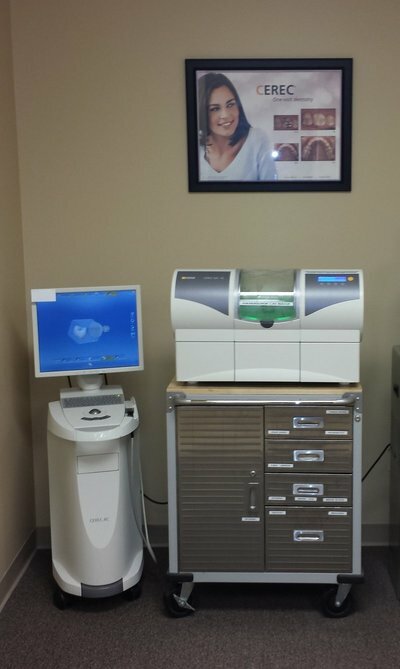 CEREC is an advanced dental technology that is utilized for the restoration of decayed, cracked, or chipped teeth. CEREC can create full crowns, inlays, onlays, and veneers. The CEREC machine crafts a restoration in a matter of minutes. CEREC restorations can be made of many materials. Most often we use a product called eMax which is made of lithium disilicate. The most beneficial feature of receiving a CEREC restoration is that it is accomplished in one visit. In addition to the benefit of a one visit restoration, there is no uncomfortable impression material to bite on or temporary to wear. The procedure for placement of a CEREC restoration is very simple. The first step is to remove all decay from the tooth. The doctor will then shape the tooth in preparation to take a digital picture. The tooth is then sprayed with a very fine powder. This allows the digital camera to take an acceptable image. Once this image is captured, the tooth will appear on a computer screen in 3D. This will allow the doctor to design the restoration right in front of you. Once the design is completed, the CEREC will mill the restoration. This step takes approximately 15 minutes. You can actually watch this process if you would like. When the restoration is finished milling, the doctor will try in the restoration and make adjustments. The restoration will then be stained and glazed to match your teeth. The glazed crown will then be placed in a porcelain oven and baked at about 500 degrees to reach it's finished state. After about 40 minutes, the crown is placed in your mouth and it is ready to use!